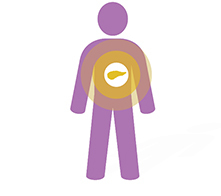 Pancreatic cancer is sometimes called the “silent” disease because in the early stages, people do not exhibit symptoms. If symptoms are present, they may be attributed to other diseases or conditions, or indicative of the cancer having spread beyond the pancreas. Furthermore, symptoms can vary depending on the individual, and often they don’t appear until pancreatic cancer is in advanced stages. Because of this, early diagnosis of pancreatic cancer is a challenge. This means that most people have progressed to later stages by the time a confirmed diagnosis has been made. Learn about tests and procedures doctors use to diagnose pancreatic cancer. visit pancan.org, the website of the Pancreatic Cancer Action Network.